I would like to point out that this Twitter account is obviously run by a sick childish internet troll and is nothing to do with me. Presumably the same sick childish internet troll who so valiantly fucked up the FOF by idly allowing Tapatalk to take over, rather than switch to Zetaboards which might have taken ten minutes longer. I hope nobody reports this fake troll site to Twitter. I've no idea what sort of person would get their kicks from constructing a fake site like this. They must be sick in the head. Yes this is disgusting Connor, I hope you're not too upset by it. 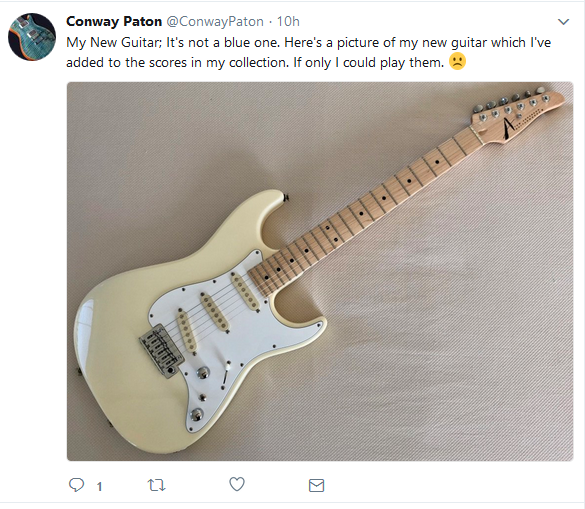 It's clearly fake, what sort of idiot would collect guitars if they don't know how to play them? It's as ludicrous as me collecting cameras. I'd just echo what everybody's said, people who do things like this are just sick scum. What's next I ask? I suppose someone will set up a fake Twitter account for dannynomates who has never caused much harm and has mostly restricted himself just to attacking dead people.